Once again I was transported back to 17th century Scotland with Crucible by S G Maclean, the third of her Alexander Seaton books. I read the first, The Redemption of Alexander Seaton in February 2013 and now a year later I’ve been just as engrossed in Crucible. I think her style of writing suits me perfectly, the characters are just right, credible well-rounded people, the plot moves along swiftly with no unnecessary digressions and it’s just full of atmosphere. I loved it. It’s set in 1631 in Aberdeen, where Alexander is now a Master at Marischal College. On Midsummer’s eve he stumbles across the body of his friend, Robert Sim, the college librarian, a few feet from the library steps, with his throat cut, blood congealing around the wound. Dr Dun, the college principal asks Alexander to investigate the matter, to look into Robert’s private life, hoping he’ll find nothing to reflect badly on the college. I found it absolutely compelling reading. Robert had been cataloguing a new acquisition to the library before he was killed and Alexander is convinced that Robert was troubled by what he found there, amongst the books of history, alchemy and hermetics – the quest for ‘a secret, unifying knowledge, known to the ancients’ since lost to us. There are many twists and turns and another man is killed before he finally arrives at the truth. 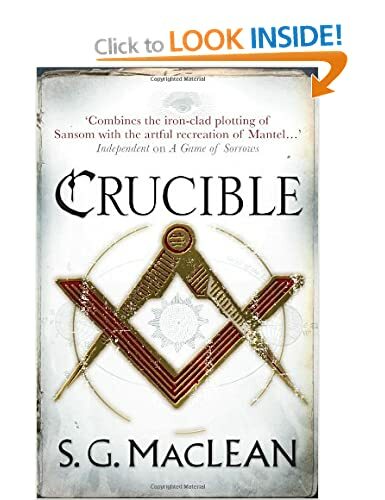 This is the third book in the series, but although I haven’t read the second book, I don’t think that matters as I think Crucible stands well on its own. The fourth book in the series is The Devil’s Recruit – the hardback and Kindle versions are available now, whilst the paperback will be available on 14 May. Now I’ve lifted my book buying ban I think I may just have to get the Kindle version soon. Crucible qualifies for four of the challenges I’m doing this year – the Mount TBR challenge, the Historical Fiction Challenge, My Kind of Mystery Challenge and the Read Scotland Challenge. Now this is a series I’ve never heard of but that sounds excellent. I shall go and investigate. I love the fact that it does for so many challenges! Hope you like it as much as I did – I borrowed the first book from the library too. This is an era have not approached in my reading. You have piqued my interest though, Margaret! Hoping my library has her books. Sounds good, and just the sort of thing I like! I’ve requested the first from the library. Margaret – Oh, I like MacLean’s work very much and I’m glad to hear you enjoyed this one. She really does do atmosphere so well I think. And when you get to it, I do recommend A Game of Sorrows. I enjoy this series too. I’ve met the author and heard her speak and she is lovely. By the way, she is a niece of writer Alistair Maclean.